I have a 2010 C14 with traction control and ABS. The ABS is great but the traction control has caught me out a couple of times, although it did work perfectly on a slippery clay hill in the middle of a rainstorm. The issue is how the power is cut and restored. One time I was on the dirt shoulder of a highway and wanted to pull out in traffic. There was lots of room but I must have spun the wheel on the dirt and so the traction control immediately cut the power. I gave it more throttle but it didn't respond and the car coming along, which normally wouldn't have been a problem, blew his horn and started around me in the other lane. A second or so later the power suddenly came on full and the bike took off, almost hitting the car that was pulling back in front of me. The whole episode lasted only a couple of seconds but was a bit scary. The next time I had to stop and make a turn at a dirt intersection. The dirt road went up a hill and there was a lot of washboard from cars. I had to give it gas to get up the hill which caused the wheel to jump on the washboard, activating the traction control. The normal reaction is to give it more gas, however the traction control releases, leaving you with about 3/4 throttle on hard dirt. There was enough traction so the bike then took off again. I had to pull out of a service centre onto a highway in the rain last weekend and I was very careful not to spin the wheel so the bike would not slow down. Seems a bit counterintuitive. You don't use the acceleration capability because you are afraid of envoking the traction control and getting hit from behind. Not impressed. Think Kawasaki needs to go back to the drawing board on KTRAC. Would like to hear comments from others. The only issue I have had is the same as you, spinning the wheel on gravel going uphill. As far as activating it on wet pavement I have yet to have a problem. I have very good tires and I usually do not give tons of throttle in wet areas. Now when I get onto gravel or dirt roads I turn off the traction control. I think you may be overreacting a bit as far as the wet roads are concerned though. If you have any decent tires on the bike it would take intention to brake the rear wheel free and activate the traction control. As for dirt and gravel, turn it off. Just so you know, your bike won't wheelie very well with traction control on either. Is that y? Jeez, what was kawi thinking! If it's a slick road (loose gravel, sandy, wet) treat it just like it is and don't go WOT. It's not really not counter intuitive and basic driving/riding. Once the traction control engages, it stays engaged for a couple seconds even after the wheel spin has stopped. When it engages, it basically takes away control of the throttle from you. If you have the throttle pinned wide open, when the traction control disengages, you better be holding on. It isn't a perfect system, and this is one of it's flaws. However, in my opinion, its still better than not having it at all. I agree with turning the traction control off while riding in gravel or hard packed dirt surfaces with gravel on them. I experienced this in VT. over the weeked while riding the gaps. I was in 2nd gear when the k-trac light went on and I wasn't getting enough power to pull out of the gravel. I down shifted to 1st gear and the bike seemed to power out of the gravel o.k. I find the k-trac works well in a patch or two of sand, slowing the wheel spin enough until the tires get grip. As far as wet conditions go, we know a good set of tires, proper throttle and braking and riding experience will win the day. But, it WILL wheelie! I found out at the Canada Day parade. My veterans riding club had been providing intersection control and we were supposed to fall in at the end of the parade. The end of the parade was painfully slow (left hand pain) so we started slaloming the fire trucks in front of us. I came out of a u turn with a little too much throttle and not enough clutch. Didn't get it very high (1-2"), but enough to wake me the hell up! I hate even the thought of traction control on a motorcycle. However, I am a mechanical engineer by training. I can pretend to be an electrical engineer once in a while, but computer software? Straight up black magic voodoo right there. No thanks. Quirky software bugs just like the OP is why I prefer to retain personal control of my motorcycle. I even have a sticker on the gas tank that reads: "CAUTION This machine has no brain Use your OWN"
I rode up a 30 degree incline down to a river bank that was covered in large deep gravel, and just held the throttle pinned the whole way, and let the traction control system work, and the bike just crawled right up the incline without spinning a tire. There is absolutely no way I would have been able to climb up that road without traction control. I've also had the bike on the water soaked skid pad with outriggers on it, and I have engaged the traction control numerous times in gravel and on slick surfaces. It has always worked flawlessly for me, and I've never had a single problem with it. My bike wouldn't power out of a soggy grass field with TC on. I was at a Rally in NYS, and we parked on the grass (read: muddy) field. When it was time to pull out the TC activated and wouldn't spin the rear at all. I expected it to tractor out at a slower yet steady rate, but since the front hadn't moved, the TC wouldn't spin the rear at all. I had to turn it off and modulate the clutch and throttle in the friction zone to get out of the mud. The guy on the BMW K1600GT powered out with TC on just fine. It was a little off putting that she wouldn't power out, even stalling the bike once. I've only had the TC kick in on me once. I'd had my '12 C14 for about a week, and I was actually riding to my insurance agent's office to sign the policy papers. As I pulled up to a red light, I noticed a heavy oily patch right in the middle of the lane, so I was careful where I put my feet. I forgot all about the oil by the time the light turned green, but as I pulled away, I noticed a distinct "lugging". I looked down to check if I'd somehow started off in second gear (which is EXACTLY what it felt like), and I saw the KTRC notice flashing on the screen. GGerg1186: I am an electrical engineer, and I've written a lot of embedded control code. I can't speak for all situations, but in the particular case that I experienced, KTRC did just what I would have wanted it to. TC saved me last week. Making a right hand turn from a red light, as I went to accelerate and merge, I felt a slight stutter caught the TC light flashing in the corner of my eye. I looked back and ridden over a very smooth man hole cover while accelerating and turning. I have no doubt that the bike would have low sided (or at least come very close to it) with out it. FWIW, for full acceleration, turn off KTRC. - if you feel the TC come on but you keep the throttle pinned , you better know what you're doing when the power comes back on. - the TC on the C14 is a rudimentary type of "slip=power cut=no slip=power back on" electronic traction control. I do it simply because I think it's wise to be familiar with how these systems function and how the bike's dynamics are affected when these sytems are activated. I also do it just to make sure that everything is functioning properly. It's not good to be scared of these systems when they are doing their jobs, and like so many things in life I think practice breeds familiarity- The only time I really dislike the TC on my C14 is when I'm accelerating away from a stop or I'm on an entrance ramp and my fun gets interrupted because I forgot to turn if off! Now you're making me wish I had a gravel parking lot! Your story reminded me of when I got my first car with ABS. I was living in Michigan at the time, and there were a few stop signs down isolated streets with plenty of visibility in all directions. After a good snow, I'd roll up late on the stop and then stomp the brake to the floor. I got to know that ABS system real well. 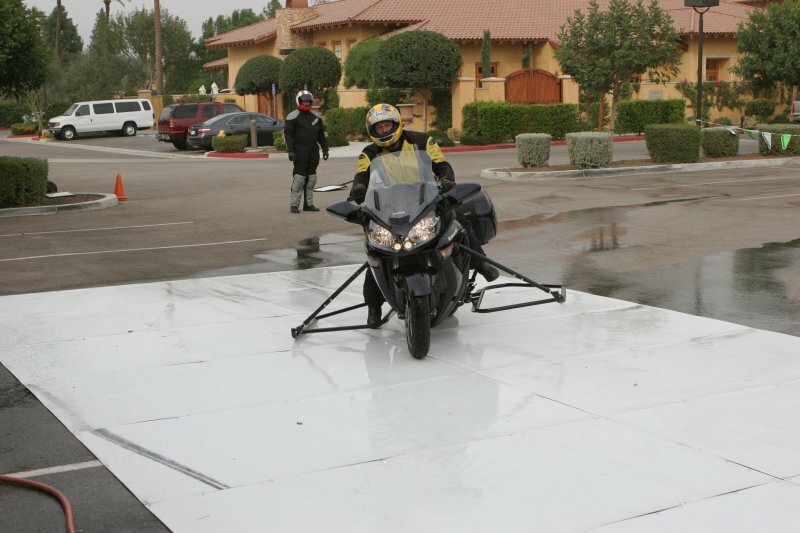 At the press intro in California, I put the bike with outriggers on it totally sideways a couple times on the skid pad. It was great fun. Hmmm... Maybe I worded that a bit awkwardly. I was talking about the first time I owned a car that had ABS. My first car had a three on the tree shifter and came from the factory without seat belts. One of the first things I did when I got my bike was hit the gravel to test things out. Next I did the same on pavement.